If you love a good Happy Planner, bullet journal, or just prefer an old fashioned paper planner to the calendar on your phone, you know how important it is to find the best planner pens. We do, too. That’s why we did the research and put together this planner pens review. Before we get started, let’s take a closer look at the features you need to know to find the perfect pens to make your planner pop. Pieces: These pens come in sets that really vary in number. There are small sets that give you 4 or 8 really quality writing instruments. Then there are sets that provide you with 24 awesome bright and inspiring colors. Colors: Regardless of how big these sets are, all but one of them don’t repeat any colors. Which is pretty great, the variety is awesome. Plus, they all include at least 1 pen with black ink for any standard writing. Waterproof: Generally, water-based inks are not waterproof. So, some of these won’t smear or fade when exposed to water while others will. Whether or not you need a waterproof pen really depends on what project you’re using them for. Point: These pens have either a medium or fine point. This one is really personal preference but usually a fine point is good for writing smaller print and a medium point is better for any kind of coloring. Tip: There are 4 different tips that show up in our reviews. The one you’ll see the most common is a felt tip. If that’s not your style, we also have plastic nibs, ballpoints, and gel pens. Now that we’ve taken a look at our planner pen buying guide, let’s move into the reviews! Here’s the deal: we listed out top pick and budget pick first. Why? Because that’s the best place to start if you’re running short on time. You’ll get a good idea of the range of items you’ll find on the rest of our list. Stick around until the end if you can. We think you’ll find something you love. Alright, let’s get started! Our top pick for best pens for writing in planners is the Sakura Pigma Pen Set. You get a really good selection here: 8 different colors. You get your standard black and blue and some bright colors so you can make sure the really important things stand out. The plastic nib is ideal for writing or drawing and the ink dries really fast. Once it’s dry, it’s not only waterproof. It’s also fade resistant. That’s not all. The ink is also archival quality. Why is it so special? The pigment molecules are bigger and more complex than standard dye molecules. That means that, instead of soaking into the paper, this ink stays in the top layers of the paper. It won’t bleed through and lasts a long time despite exposure to UV rays or pollution. The best pens for planners if you’re on a budget are the MyLifeUNIT Pen Set which also happen to be our budget pick. 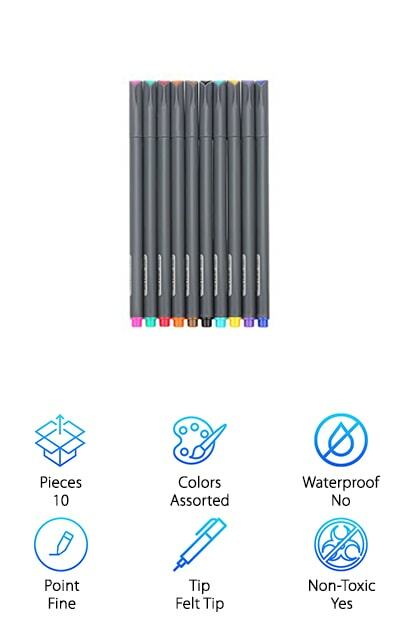 This is an impressive set of 10 pens that includes black, blue, and 8 other brilliant colors so you can make things in your planner pop. 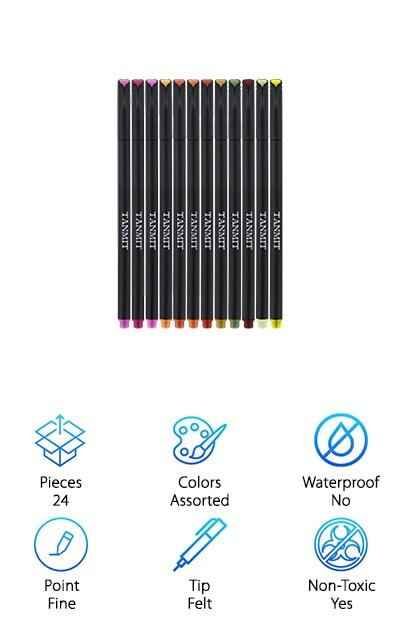 We really like the fine tips on these pens, they’re great for writing, drawing, and coloring. Plus, they have an ergonomic shape so you’ll be comfortable writing for long periods of time. The ink is water based, too, so it will wash out of most textiles. It’s smooth, too, which makes writing with them all that much better. They have minimal bleeding and are acid-free. One more thing, they come packaged in a soft transparent vinyl bag so it’s easy to keep them together in one place. One of the best no bleed pens around comes from one of the most well-known brands. Sharpie Art Pens aren’t like the Sharpies you know and love. These aren’t permanent markers. They have a fine point and bright ink that make them perfect for writing in your planner, bullet journaling, or for adult coloring. Plus, they’re water, fade, and smear resistant and won’t bleed through the paper. You really can get a lot of detail with these pens. They come in a hard case that opens into an easel so you can keep them on display and easy to reach while you’re working on your project. This is a 12 pen set that includes blue and black as well as colors like coral, hot pink, and clover. The colors are all really deep and saturated as well. If you’re looking for the best colored pens for planners, you can’t go wrong with Paper Mate InkJoy Pens. These aren’t the plain blue Paper Mate pens you’re used to. InkJoy is more and an awesome reinvented version of a classic. The ink is super smooth and they have a nice, medium sized tip so you get a nice, bold line. We really like that these pens are clickable. 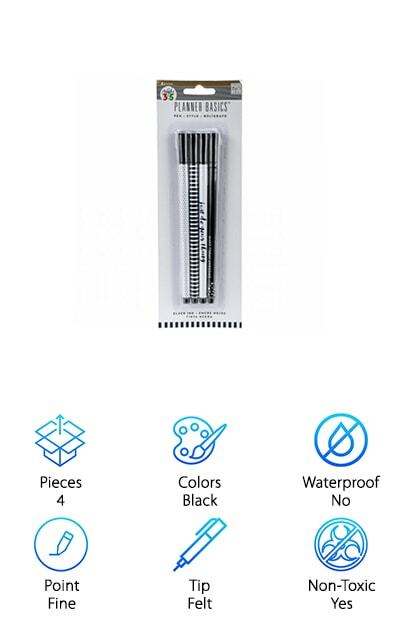 If you’re someone who tends to lose pen caps a lot, a clickable pen is the answer. Plus, the rubber grip is really comfortable. 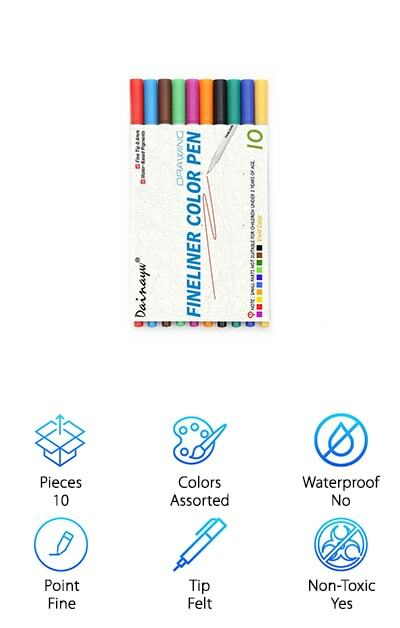 This 10-pack comes with a range of colors so they’re perfect for planners. It’s really easy to color code things. These pens are designed for smoothness. The tip starts to release ink when it makes contact with the paper and the ink is really fluid. One of the largest planner pen sets we found in our research is the iBauam Fineliner Pens. 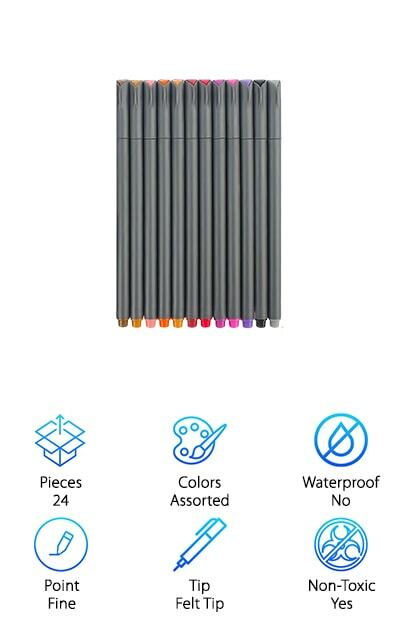 So, exactly how many pens do you get? 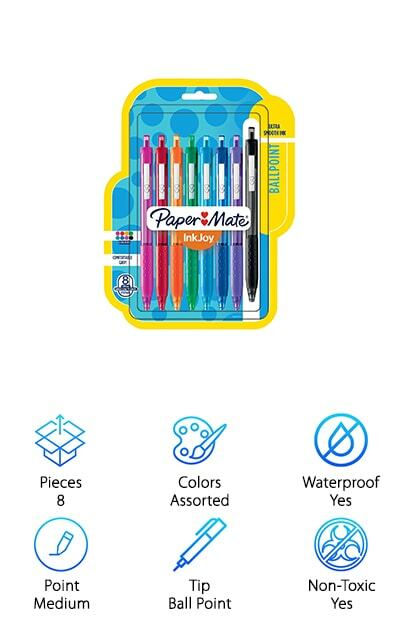 Get this - there are 24 pens in the set with no duplicates. The fine tip is perfect for writing appointments in your planner, bullet journaling, drawing, or just taking awesome notes in class. The ink is smooth plus it’s acid-free and water based. These are good for kids, too, because they’re non-toxic. And get this: they come in a plastic storage case that has a snap closure. You can throw them in your bag and easily carry them with you anywhere. That’s not all. These pens actually come with a 100% satisfaction guarantee. If you don’t like them or if there’s something not right, you can get either a refund or a complete replacement. For an awesome set of gel planner pens, you can’t go wrong with these from Passion Planner. One of the best things about these pens is they come in some really interesting colors. Some of them are unique to this set, actually, like the browns and greens that have a rare earthy feel. They’re archival quality, too. They won’t bleed, smear, fade, or skip. They have a wide medium point and are smooth and precise when you write with them. Because they’re water based, they’re also non-toxic which makes them perfect for kids. Each pen has a wide, soft rubber grip that’s color coordinated and makes them super comfy to write with. Plus, no finger bumps! One more thing about these, they come with a risk free guarantee. If you don’t like them for any reason, just contact the manufacturer. 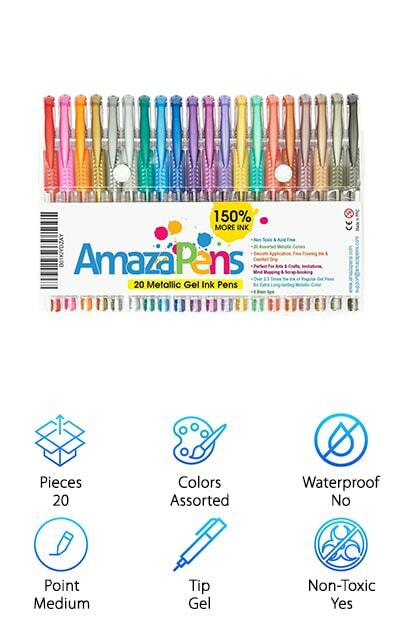 A great choice if you’re looking for the best planner pen that gives you a lot of variety are the Tanmit Planner Pens. This set comes with 24 different colors with no repeats! 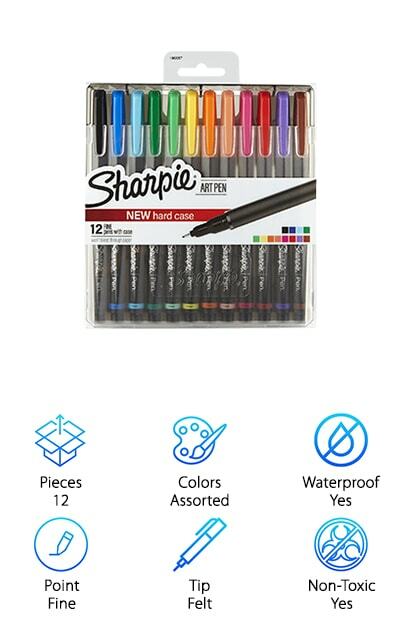 They’re perfect for writing in your planner or bullet journal and even make great fine-ink drawing pens. The fine tip makes precise lines and details which is really helpful if you’re trying to write something important in your agenda and don’t have a lot of room. It comes in handy if you’re coloring an intricate, detailed design, too. The water-based ink doesn’t dry out and has minimal bleed through. Plus, it’s non-toxic and acid-free. It also comes in a clear, soft vinyl case that snaps closed, making it perfect for travel. And get this, if they’re damaged or you’re not satisfied, you can get a free replacement or refund. This set from Ucolor Mate includes so many cheerful colors, they might just be the best pens for Happy Planner. First of all, they’re really comfortable to write with. They’re lightweight and ergonomically designed so you’ll be able to write for extended periods of time. Plus, they come in 12 different colors which means it’s really easy to make sure important notes and events stand out in your planner. That’s not all, you can use them for bullet journaling, coloring, or making sure the notes you take in class or important meetings really highlight the essential information. They come in a soft vinyl bag, too, perfect for tossing into your bag for work or school. The ink is not only really vibrant, it’s also smooth and doesn’t bleed through most paper. All that and you get a 100% satisfaction guarantee. Next up in our list of the best pens for planners is this set from Dainayw. This is a good sized set. 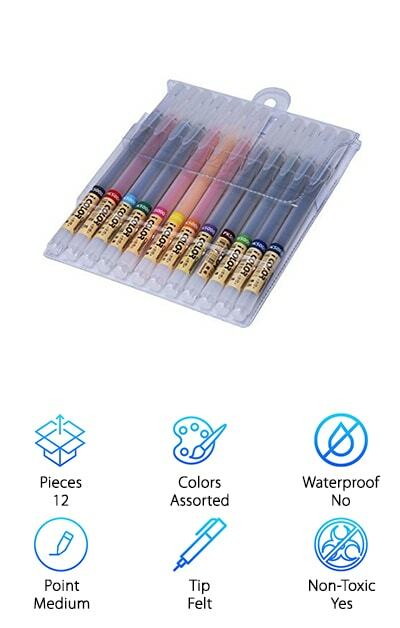 It comes with 10 pens altogether, 10 different bright colors with no repeats. They have a really fine felt tip with a metal-clad tip that really helps you write very precisely. The ink is high quality, too. It doesn’t easily dry out plus it’s acid-free and has minimal bleed through. And get this: the lighter colors actually work well on black paper. If you want to make sure important dates stand out in your planner, these are a great choice. 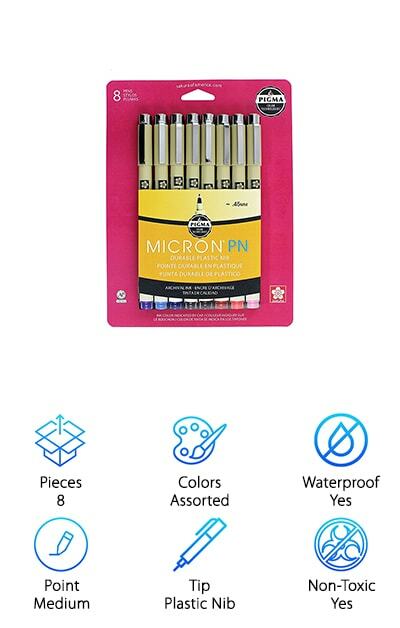 They’re versatile enough to use for a variety of different art projects or to make your bullet journal or notes from a business meeting really pop. One more thing, they come in a plastic case for safe-keeping. There might be no better choice for Happy Planner pens than the ones that come right from Happy Planner themselves. These pens are a really great choice if you’re looking for a set of black ink pens that are reliable. The ink is smooth and they create a dark, precise line. And they won’t bleed through. We really love that these pens write so well but the thing that put them over the top for us is the awesome design. If you’re looking for a pen that has a little bit of pizazz, you have to check these out. Each pen comes with a different black and white design. One is striped and one is white with small black polka dots. The last 2 have fun, inspirational phrases on them: Make Today Awesome and Just Do Your Thing.